Beautiful Mt. 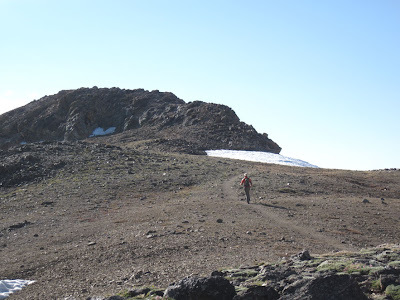 Belford is a simple climb: a series of switchbacks through the trees, a series of switchbacks up its northwest ridge. There is a soft, solid trail all the way from the bottom to the top, and an excellent summit block of jagged rock. The views are excellent, and the day was perfect. 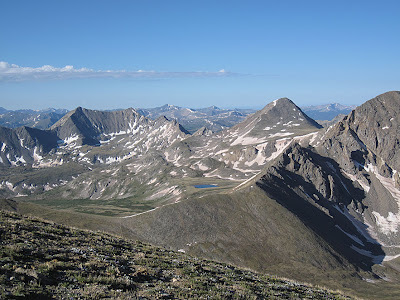 After a day in Buena Vista (our first breath of civilization for five days) that was more frustrating than refreshing because of the crowds of people, we decided to backpack into Missouri Gulch and set-up a high camp just below treeline at 11,300'. Contrary to the day before when there was a virtual city burgeoning in the wilderness, this well-worn high camp was almost empty. We shared the beautiful expanse with only two other tents. This seemed odd to us, since it was a saturday night. We had worried before setting out that we might even have trouble finding a spot. 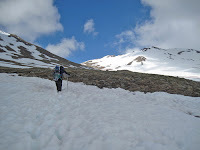 Though the steep approach was difficult with fifty pounds of gear on our backs, we were the first on the trail in the morning and had the mountain seemingly to ourselves all the way to the summit. On top we were having one of the best days yet of our summer, and the mile and a half traverse to Oxford looked strenuous. 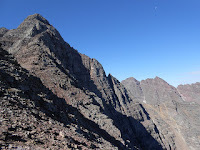 We decided that, instead of being peak baggers, we wanted to cherish our wonderful experience on Belford and not push ourselves to the point of exhaustion simply to bag another summit. Besides, Oxford is a peak worthy of its own experience, and we decided that a return trip, perhaps with a backpack into the Pine Creek Basin on Oxford's opposite side, would be the best way to do the mountain justice. So Oxford joins Lincoln and Bross on the "Mountains Left Behind" list, but it gives us just another excuse to return for more climbing. We retreated to Buena Vista for a few days respite in the local KOA. Showers and a washing machine! 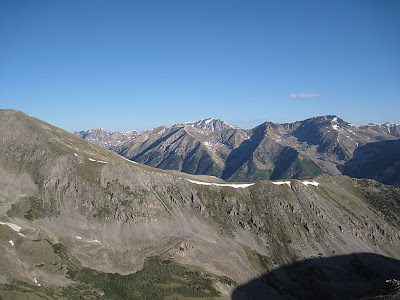 Our climb up Belford was yesterday, and today we had a great soak in the Mt. Princeton Hot Springs and discovered a wonderful new brewpub on South Main near Buena Vista's whitewater park. Great pizza, and great beer, and a dramatic change from campstove pasta and oatmeal. Tomorrow, if the weather holds, we are back into the woods for a three day backpack into the Horn Fork Basin to attack Mt. Harvard and Mt. Yale.